I had originally planned to make Garlic Mushrooms, one of the easiest recipes in my repertoire - except for the part where you have to peel and chop about an entire pod of garlic. 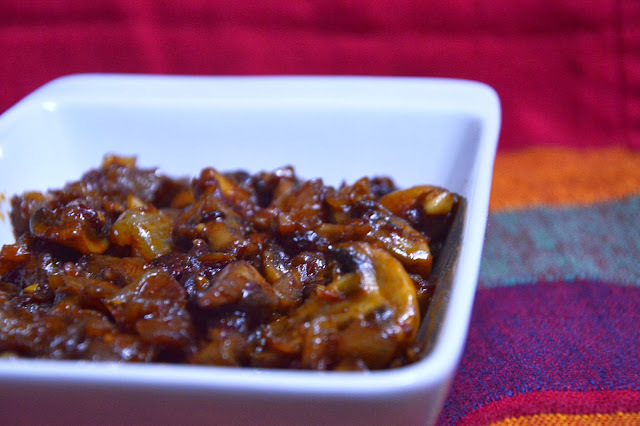 As I stared at the mushrooms and tried to get enthusiastic about peeling garlic I suddenly remembered the container of Schezwan sauce that Chef Raunak of Soy Street. Vashi, had given me a few days back. It was the absolute answer to my prayers! Wash the mushrooms thoroughly and get off all the mud and grit that's on them. Chop into quarters. Heat a tablespoon or so of any neutral oil in your wok. Once it's hot chuck in the chopped onions and fry for a couple of minutes till they turn translucent. Now add the mushrooms and fry for a while. Reduce the heat and let the mushrooms cook for a bit. They will release a decent bit of water so you won't need to add any. Once the mushrooms are nearly done and the water has dried up put in at least 2 - 3 tablespoons of the Schezwan sauce. Add some of the oil too. Turn up the heat and mix the sauce and the mushrooms really well. Serve with hakka noodles or a simple fried rice.